A symbol of mass motorisation in Italy, of which almost 3.8 million were sold, the original FIAT 500 was introduced on this day in 1957. Exactly fifty years later, on July 4 2007, FIAT chose to celebrate that heritage by introducing the New FIAT 500, a car which embodied the same spirit and personality as the original and which has also enjoyed phenomenal success all over the world. Eight years on, with over 1.5 million produced, the torch is now being passed to the New FIAT 500 with which FIAT is preparing to take on new market challenges without forgetting its illustrious roots. 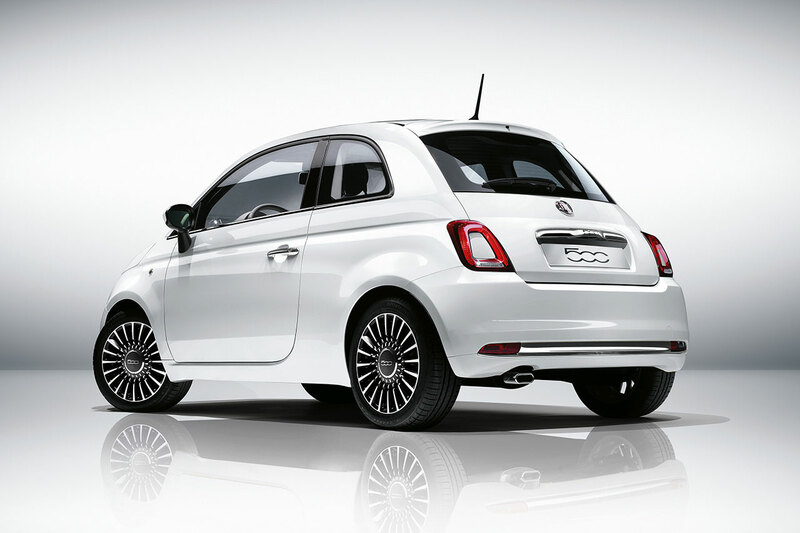 Centro Stile FIAT has refreshed the exterior and interior, retaining the unmistakable 500 look that has made it such a global success but at the same time making even more attractive and contemporary. It has not grown in size but it has grown in maturity with advanced technologies, improved efficiency and even more customisation ideas. In this way, FIAT has carefully evolved and refined the features which have made it an Italian masterpiece in the first place. Available in two body styles (hatchback and convertible), the New FIAT 500 will be available in three trim levels: Pop, Pop Star and Lounge. All models have LED daytime running lights, seven airbags and a Uconnect infotainment system with six speakers, AUX-IN/USB ports and steering wheel remote controls as standard equipment. The Pop Star version in the UK adds air conditioning, body-colour mirror caps with defrosting function and 15-inch alloy wheels, while the Lounge version adds sophisticated features such as a panoramic glass sunroof, rear parking sensors, a chrome front grille, front fog lights, a leather-trimmed steering wheel and a Uconnect 5” LIVE touchscreen infotainment system with smartphone integration and numerous built-in apps to help users stay safely connected while on the move. The engine line-up of the New FIAT 500 at launch includes a 0.9-litre TwinAir engine (85hp or 105hp) and a 1.2-litre 69hp unit. The two-cylinder engines boast exceptional efficiency – 90g/km for the 85hp engine and 99g/km for the 105hp unit – while a new ‘Eco’ configurations of the 1.2 litre 69hp (available after the launch) will reduce emissions to 99 grams of CO2 per kilometre (UK availability TBC). Bold and seductive, the New FIAT 500 benefits from no fewer than 1,800 innovative detail changes, all designed to enhance the ownership experience and refine its inimitable style. Most noticeable are the new front headlights with LED daytime running lights and the new rear light clusters, not to mention the revised colour palette; the revamped dashboard and the improved materials used throughout. The updates are substantial, with a focus on technological evolution, but loyal to the unmistakable 500 style so as not to upset the successful balance of exclusivity and accessibility it embodies. 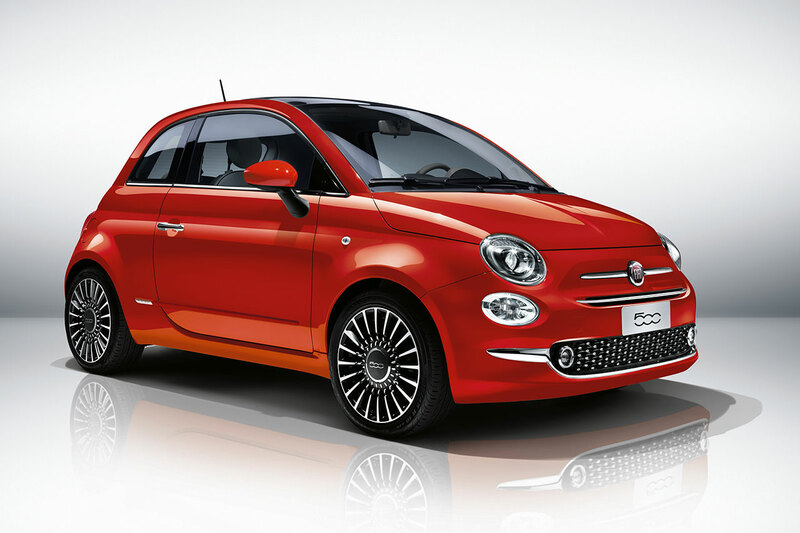 The FIAT 500 is a global best-seller with a quintessentially Italian heart – elegant and stylish but also affordable and packed with fun – and with its carefully considered enhancements, New FIAT 500 will undoubtedly reassert itself as the benchmark in its segment from every perspective. Lingotto in Turin was chosen for the world première of the New FIAT 500. Opened in 1923, the FIAT factory was famed for unusual production process, which worked its way upwards through the building floors with completed vehicles emerging onto its functional test track on the roof. Designed by architect Le Corbusier, Lingotto became a symbol of burgeoning Italian industrialisation even before it was completed. After being decommissioned, Lingotto was renovated to suit the needs of a changing urban fabric but despite the comprehensive interior refurbishment it maintained its symbolic exterior appearance unaltered. As a result, Lingotto remains an important landmark in Turin thanks to the manner in which it has been evolved and adapted over time while remaining true to its tradition, not unlike the iconic FIAT 500, which is why it was selected as the launch venue for this important vehicle. An important element of the appeal of the 500 has always been its compact shape. The new car retains its city-friendly dimensions – 357cm long, 163cm wide and 149cm tall with a wheelbase of 230cm – but the design of the front and rear ends has been sensitively refreshed to ensure the identity of the popular and beloved 500 remains. The exterior style of the New FIAT 500 expresses all the distinctive elements which characterised the 1957 original but now reasserts this appeal with more a contemporary look and additional technical content. The most obvious reference to the past can be found at the front: New FIAT 500 retains the “face” of its predecessors with headlights which are still circular in shape but have a more dynamic slant to convey a bolder and more confident gaze. These clusters integrate the dipped-beam headlamps and turn signals and use innovative polyellptical modules for improved night vision and extra safety – its 'eyes' are always on the road! 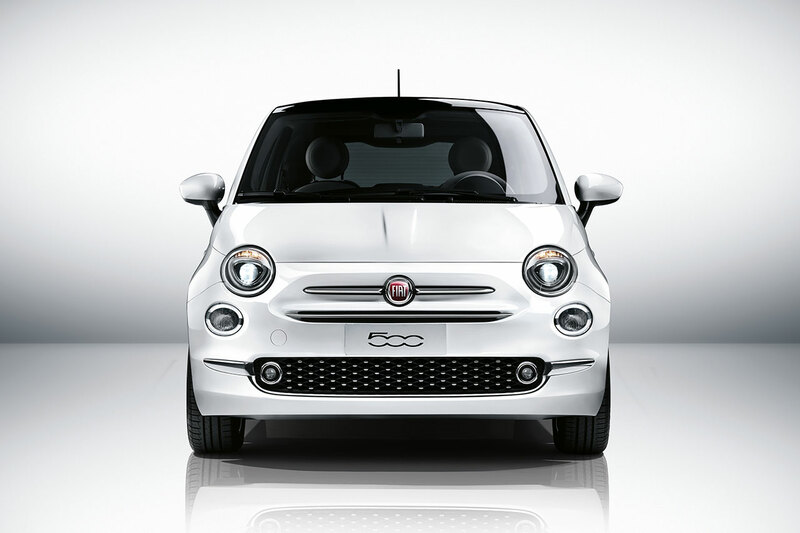 The lower light cluster integrates the main beam headlights and LED daytime running lights, which adopt the circular profile of the lamp to graphically reproduces the zeros of 500 allowing the New FIAT 500 to stand out even when it’s dark. The bonnet retains its distinctive, traditional clamshell form, another nod to its legendary predecessor, and this is complemented by a harmonious, trapezoidal nose which stands out thanks to more pronounced ribbing and complemented by elegant chrome 'whiskers' on both sides of the FIAT badge. 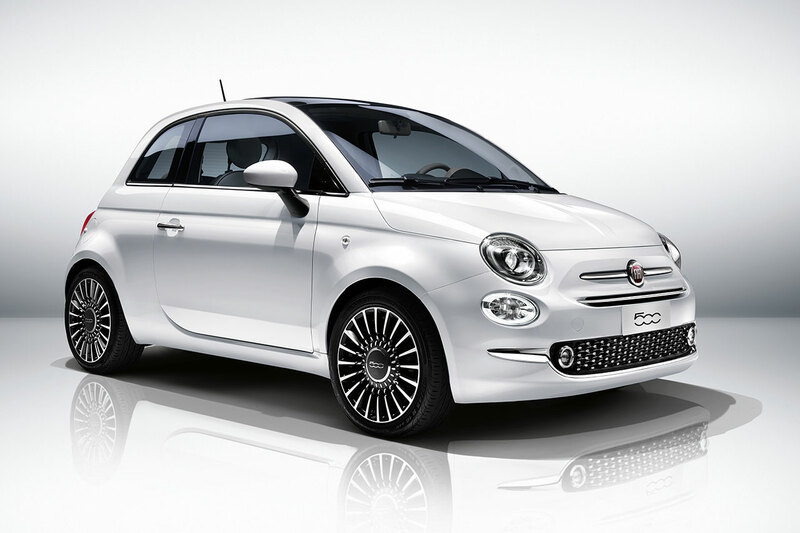 The auxiliary air vent is now fed via a three-dimensional grille (with chrome-effect buttons on the Lounge version) flanked by chrome brightwork to give the New FIAT 500 stronger visual presence. 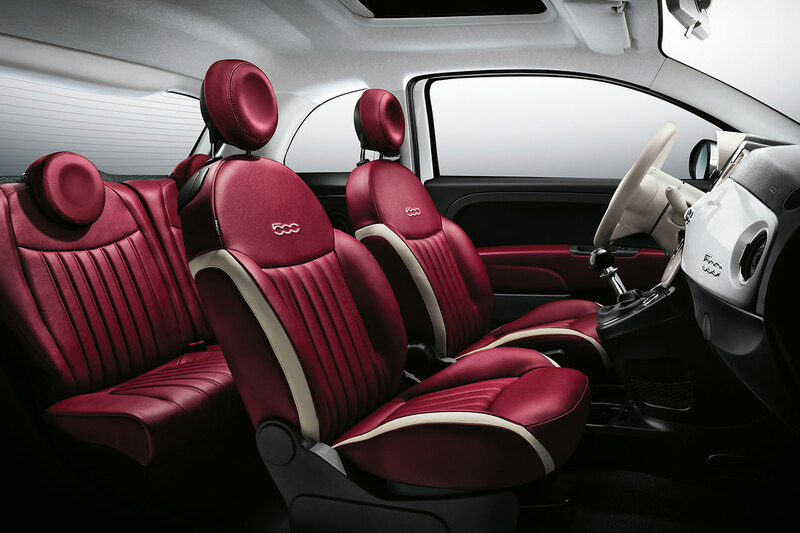 The rear of New FIAT 500 is transformed by the addition of exclusive new 'empty' light clusters comprised of an innovative ring-shaped structure with body-coloured centres. Thanks to these new clusters, which are unique to the segment, light appears to emanate from the bodywork almost like an illuminated tattoo! The rear fog light and reversing light, are relocated to the edges of the redesigned bumper trim, finished either in black or chrome depending on model. This division is functional and guarantees greater light efficiency. 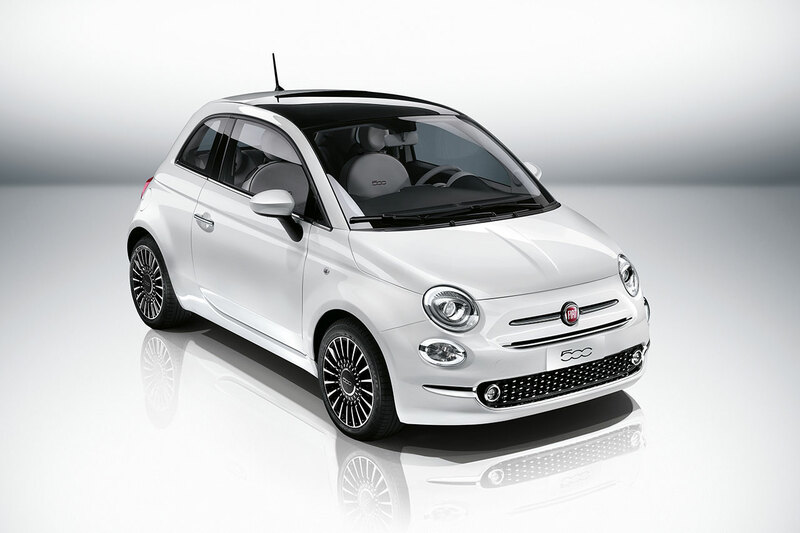 Naturally, New FIAT 500 retains the large chrome grab handle that is deliberately reminiscent of the number-plate light of the original FIAT 500. The profile is still soft and round, with an airy glasshouse, minimal overhangs and a very short bonnet, while its beltline is slightly inclined towards the front to give New FIAT 500 a tough, confidence stance. New alloy wheel designs are also introduced in New FIAT 500, offered in 15- and 16-inch sizes and available in a variety of finishes including an elegant diamond-cut design. The colour palette now totals 13 hues (seven pastel, one solid and five metallic) including two new colours: Glam Coral and Avantgarde Bordeaux. 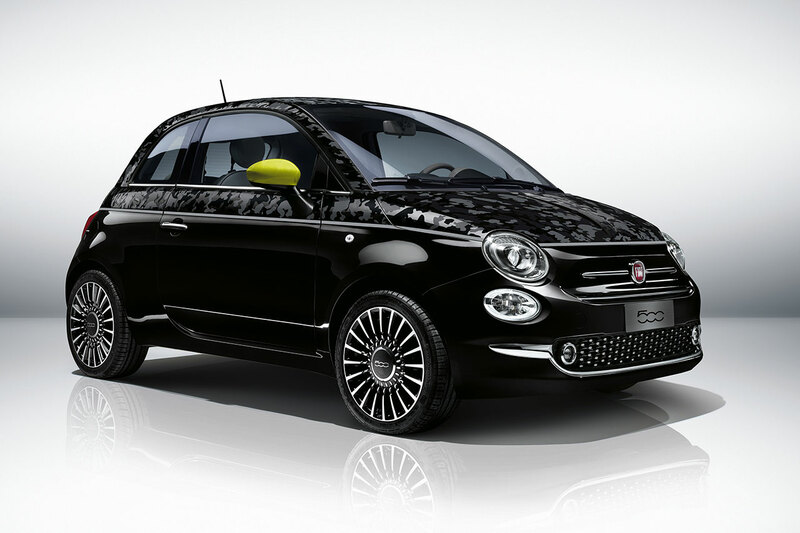 Two striking black-yellow and black-red variants are also available as part of the FIAT 500 'Second Skin' initiative which offers a range of customisation options capable of satisfying every creative taste imaginable. Indeed, it is possible for every 500 driver to tailor their cars with exciting new looks, making walking into a dealership increasingly similar to walking into a high-end Italian fashion house. There are two types of second skins, the first features a fashionable, geometric pattern along the belt line only, while the larger skin options cover the pillars and roof – and in some cases the bonnet and tailgate as well. Five patterns are offered: Ethnic (geometric pattern); 'Lord' (classic tartan); 'Comics' (pop decoration) in combination with the new two-colour body paintwork; 'Navy' (nautical patterns) and 'Camouflage' (fashionably military). Like a tailor-made garment, everyone can express their own personality with the distinctive 'Second Skin' collection of the New FIAT 500. The interiors are extensively revised, most noticeably in terms of dashboard design: it now integrates the advanced Uconnect infotainment (touchscreen on the Lounge version) across the range. The unit is not only easier to read and more intuitive to use, it also improves connectivity and functionality. The dashboard dome and air vents are also redesigned to accommodate the new unit. The new steering wheel features new remote control buttons which are easier to operate and, thanks to their chrome-plated edging and high-quality materials, more pleasant to touch and to behold. The circular instrument cluster, with analogue dials for speed and engine revs and digital secondary gauges, is retained for Pop and Pop Star models, while the innovative seven-inch TFT display, developed in collaboration with Magneti Marelli - the international leader in the design and manufacture of high-tech automotive systems and components – is optional on the Lounge version. The driver can monitor data from the speedometer, odometer and trip computer simultaneously at a glance, while the central section of the display – sporting an image of the car – can be configured to show distance travelled, fuel consumption, range, trip time etc. Warning messages and the Gear Shift Indicator, which advises when to shift gear to maximise fuel-efficiency, are also displayed in this cluster in a highly visible manner. The TFT display is also integrated with the Uconnect™ Radio LIVE and Uconnect™ Radio Nav LIVE so that the media player, telephone and navigation messages also appear on the screen and the LCD screen also reconfigures itself when the Sport button is activated on 0.9 TwinAir Turbo 105hp engine versions. Further enhancements include a new lidded glove box on the passenger's side and a revised centre console with new cup holders and a relocated 12V power socket. New electric window switches, which adopt a push-down-pull-up operation, complete the visible interior revisions, while additional soundproofing panels in the wheelhouse and firewall making the passenger compartment even more comfortable and refined. 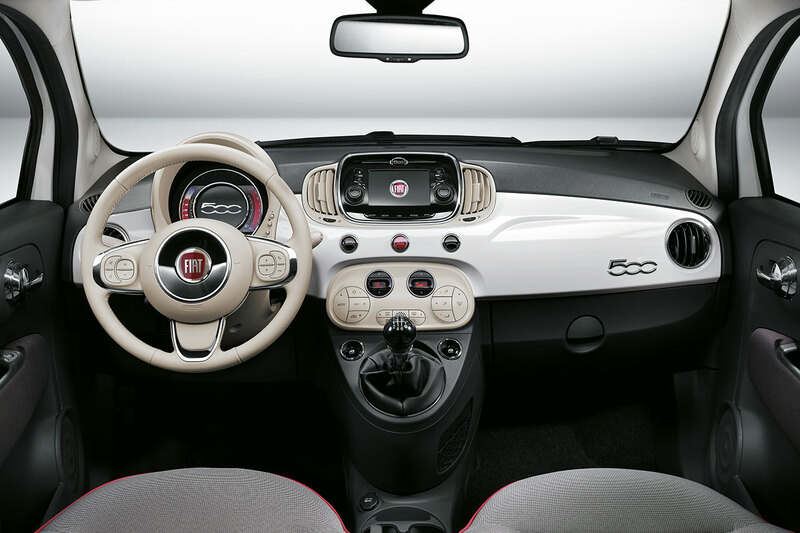 In place of the audio system of the previous 500, the new Uconnect™ system now takes pride of place in middle of the dashboard of the New FIAT 500. On the entry-level version, the system includes; FM/AM radio; remote controls on the steering wheel; AUX-IN and USB ports and six speakers as standard. Lounge models are equipped with the Uconnect™ 5” Radio LIVE system which is a touchscreen unit complete with Bluetooth hands-free calling, voice recognition and an SMS reader for reading text messages received on compatible telephones using 'text to speech' technology. The driver can connect multimedia devices via USB or using the 3.5mm auxiliary jack or stream music via Bluetooth using a compatible smartphone. DAB digital radio is also available. Uconnect™ LIVE services also debut on the New FIAT 500 (UK availability TBC). The Uconnect™ LIVE app can be downloaded from Apple Store or Google Play Store and as soon as the smartphone is connected to the New FIAT 500 Lounge, many applications can be viewed and controlled via the touchscreen of the Uconnect™ system. The apps have been designed and adapted for use while driving to keep users concentrated on the road ahead. Uconnect™ LIVE allows direct access via the touchscreen to TuneIn Internet radio, with over 100,000 stations worldwide; Deezer Internet music, with over 35 million tracks for ’Deezer Premium‘ users; Reuters, to keep up-to-date on the most recent world news, and Facebook and Twitter, for staying in touch with friends. Uconnect™ LIVE can also be used to access eco:Drive, the award-winning driving style app which assists drivers to improve fuel consumption by up to 16 percent and contributes to reducing CO2 emissions by providing driving tips in real time. Uconnect™ LIVE even connects directly to my:Car with real time warnings, service deadline memos and an interactive owner handbook to manage car maintenance. 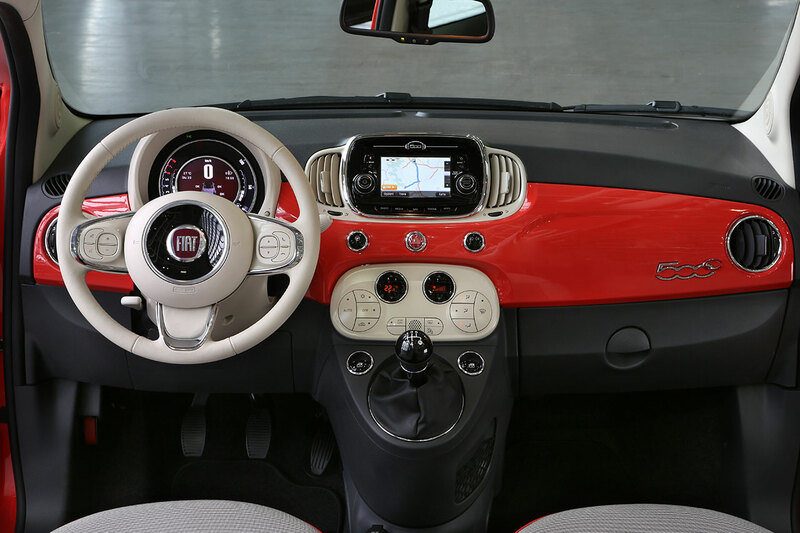 For the first time on the FIAT 500, an integrated Uconnect™ 5” Radio Nav LIVE with voice-activated TomTom satellite navigation is available as an option. The TomTom IQ Routes® function calculates the fastest route based on real-time average speeds and for maximum safety and ease-of-use the system includes an advanced lane indicator, to ensure you’re in the correct lane at complex and unfamiliar junctions or intersections, as well as turn-by-turn instructions which are safely displayed on the instrument panel. The TomTom Live service taps into the world's biggest source of traffic information with over 100 million of monitored kilometres of traffic data collected every day. The navigation system updates every two minutes allowing the Uconnect™ system suggest faster routes and provide more accurate estimated arrival times. In addition to real time information on traffic conditions, users can also benefit from the information on the location of fixed and mobile safety cameras and weather forecasts. Finally, with TomTom Search & Go users can run searches by category or type, like petrol stations or supermarkets, and be directed there. The New FIAT 500 is powered by a range of environment-friendly, Euro 6-compliant engines combined with five- and six-speed manual gearboxes or a Dualogic robotised transmission depending on the model. The engines line-up available at launch include the 1.2 litre 69hp, the TwinAir 85hp and the TwinAir 105hp. The TwinAir 0.9 85hp has an official fuel consumption figure of 74.3MPG or 3.8 litres/100 km on the combined cycle with CO2 emissions of 90g/km, remarkable figures which not only have positive environmental implications but which also ease the burden on the owner's pocket too. The New FIAT 500 range will be expanded after the launch with the 1.2-litre 69hp engine in 'Eco' configuration and the 1.3-litre 16v Multijet II 95hp turbo diesel unit. Please note, the UK availability of both engines is to be confirmed. The 1.2 ‘Eco’ will be equipped with a smart alternator, a specific aerodynamic pack and new 14- or 15-inch tyres with low rolling resistance and high resistance to wear resulting in a reduction in CO2 emissions from 110 to just 99g/km. The New FIAT 500 is the only car in its segment, alongside the FIAT Panda, to offer a small diesel engine ideally suited for those with long commutes into congested cities: The 1.3-litre 16v Multijet II 95hp will emits only 89 grams of CO2 per kilometre and comply with Euro 6 standards when it goes on sale later in the year. Engineered to comply with the toughest standards, the FIAT 500 is one of the safest cars in its segment. The popular 1.2 69hp version is now equipped with larger brake discs for even more effective and powerful braking, and seven airbags (front, window and side airbags, plus a driver’s knee airbag) remain standard across the range as before. Active safety systems include ABS with electronic brake distribution (EBD), advanced electronic stability control (ESC), anti-slip regulation (ASR), Hill Holder and hydraulic brake assistance (HBA) to help with emergency stops. Standard equipment across the range includes seven airbags, Uconnect™ Radio with six speakers, AUX-IN and USB ports and steering wheel remote controls as well as LED daytime running lights. The Pop Star version adds air conditioning, body-coloured mirror caps with defrosting function, 15-inch alloy wheels and a 50/50 split folding rear seat with rear headrests while the Lounge model adds luxury equipment including a panoramic glass sunroof, rear parking sensors, a leather-trimmed steering wheel, front fog lights, chrome front grille and the touchscreen Uconnect™ infotainment system. A full range of Mopar accessories is also available from launch, including vintage-style wheel trims; a range of alloy wheels with different designs, colours and finishes; mirror caps either in chrome-effect or painted in a variety of colours; distinctive side badges; chrome roof mouldings; a rear spoiler and a range of decals for sides and the roof. A tailgate rack is also available with two systems for transporting winter sports equipment, like skis and snowboards.